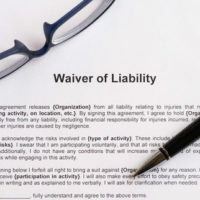 Does Signing a Liability Waiver Kill Your Right to Sue for an Injury? In today’s world of doing everything possible to mitigate responsibility and avoid potential personal injury lawsuits, liability waivers are a common sight. Almost every activity in which a person participates, from an exercise class to an organized group hike in the local park, involves the signing of these documents. Few people read the language of these agreements, but they essentially surrender a person’s right to file a negligence lawsuit in the event of an injury. While Florida will enforce the terms of a liability waiver and block an injured party from bringing a lawsuit for compensation, certain requirements must be met or a court will allow a negligence lawsuit to proceed. Further, certain behavior is beyond the scope of a liability waiver, rendering the waiver inapplicable if it occurs. Given how often people sign these waivers without thinking about the consequences, a discussion when a court will enforce liability waivers, as well as circumstances that could convince a court to invalidate a liability waiver, will follow below. Florida courts have ruled that liability waivers must have clear and unambiguous language to be enforceable. Further, the terms must specifically limit liability, and cannot allow either party a means to avoid being bound by the agreement. Consequently, the person signing the waiver must fully understand what he/she is giving up by signing the agreement. If the language in the waiver is not clear about its effect on a person’s legal rights, a court will not enforce it, and instead, permit an injured party to sue for negligence. While a liability waiver will block a lawsuit for negligent conduct that causes an injury, it does not cover reckless or intentional acts that hurt a third party. For example, if the instructor in a rock climbing class deliberately disconnected his/her harness, causing a climber to fall, a liability waiver would not shield the company from a lawsuit, and since the conduct that caused the injury was intentional, the injured party could be entitled to punitive damages. Finally, Florida law specifically recognizes a parent’s authority to waive liability for activities in which his/her child participates that involve inherent risk. Young children are especially likely to sustain serious injury from participation in certain activities, and parents should consider that before signing a liability waiver. One recent example in the Tampa Bay area saw a three-year-old end up in a body cast for injuries sustained at a trampoline park. Activities that involve inherent risk are those that include dangers integral to the performance of the activity itself, and are unable to be eliminated even if due care is taken to protect the child’s safety. Additionally, inherent risk also refers to the failure of an activity provider to warn about the risk, and the risk that another participant or child could contribute to the child’s injury or death. Some examples of activities that are commonly considered to include inherent risk are cheer camp and ice skating. In order for the liability waiver to be enforceable, it must appear in uppercase type that is five points larger than the surrounding text, and state that liability is being released for injuries or deaths related to risks natural to the activity. Agreements that conform to these requirements will be presumed enforceable, though a parent can rebut the presumption by establishing it does not meet the requirements, or the injury/death did not arise from a risk inherent in the activity. People should be able to participate in activities with the comfort that proper precautions were taken to protect their safety. If you were injured due to someone else’s negligence, contact a personal injury attorney to learn about possible legal options. The Miami law firm of Pita Weber Del Prado knows how to win cases against irresponsible business owners, and is available to help you. Contact us for a free consultation.